Matt D. — Ascend P.T. I've been coming here for a couple of weeks with an old shoulder injury that's never gone away. 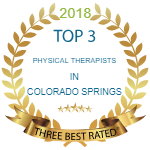 I've worked with other physical therapists in the past, and even chiropractors, and no one was able to help beyond just throwing some ice on the area and doing basic stretches. Heather was able to figure out what was happening immediately and get to the root of it, and after only a few visits, my pain is completely gone. I can finally get back to my usual training in the gym, completely pain-free. I was blown away by the quality of their service, having been to many other PTs, and wouldn't hesitate to recommend them to anyone. This place is awesome!